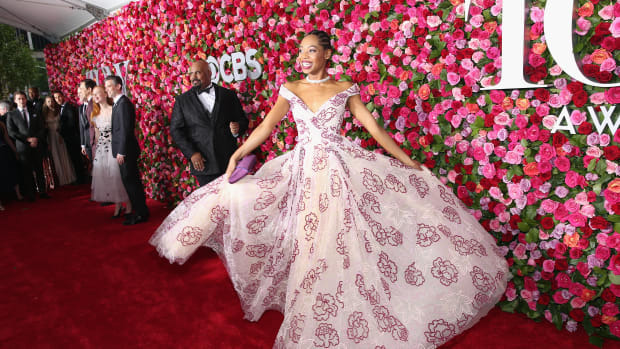 The annual Tony Awards were held on Sunday night at Radio City Music Hall in New York City and in typical Broadway fashion, the attendees really turned up the glitz and glam. Stand-out looks included Kate Mara in a sparkly, embellished black Dolce & Gabbana dress with short sleeves and Gossip Girls&apos; Leighton Meester, who blew us away in a long, bridal white gown by Antonio Berardi in her first public appearance with husband Adam Brody after their wedding. The fashion on stage wasn&apos;t bad either: We couldn&apos;t help but get giddy at the sight of Patti Labelle and Gladys Knight onstage together with Fantasia Barrino and the cast of "After Midnight" performing in dresses reminiscent of Doo-wop&apos;s heyday. Click through the gallery below to see what all the stars wore on Broadway&apos;s biggest night of the year. Great style was blooming all over this red carpet. Get it?